Home Disney TipsDisney Social Media Moms Celebration	Disney Style: Social Media Moms edition! 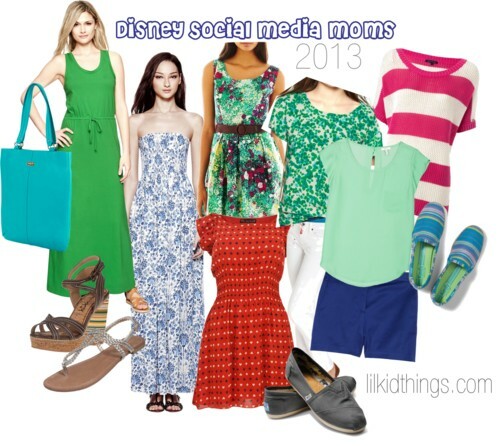 I had a lot of fun pulling outfits together for this year’s Disney Social Media Moms celebration. For one thing, it’s sundress season! I am a total sucker for a cute sundress so I had no problem scooping up some favorites. But I also wanted to make sure I could move around comfortably and enjoy our time there so good shoes were high on my priority list. In case you need a refresher, here is my original post and idea board. I asked around and so many people recommended TOMS that I had to go for it. I found a pair locally after ordering and returning a pair online that didn’t fit. The pair I ended up with was a full size and a half smaller than I usually wear which is so strange. Each pair is different so make sure you try them on before buying! With that warning out of the way, I have to tell you that I am in L-O-V-E with these shoes. They were perfect for walking all day and I did wear them almost every day in the parks. I got 2 blisters on the very last day, which is pretty great if you ask me! For the conference portion of our trip, I mainly stuck to wedges or sandals for the slightly dressier events. I was so comfortable all weekend, I know I will be living in these clothes all summer! Here is a recap of my Disney style, created with the awesome and brand new Story app for iPhone from Disney! For the day after our trip (also called re-entry) I wore one of my favorite gifts from the conference! The social media team created t-shirts just for us with a picture of Snow White that says “I have seven followers”. I die! Not only is the shirt adorable, it is a super comfortable Hanes shirt (Hanes was a conference sponsor) so I know I will wear it often. Do you have a go-to theme park look? Have you taken my survey yet? I’d love to know how I can make visiting Lil-Kid-Things a better experience for you! 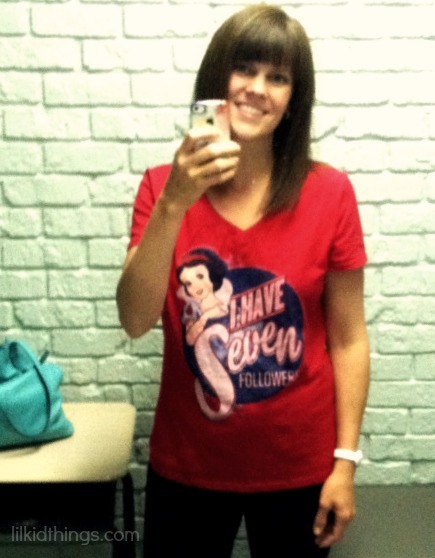 I attended the Disney Social Media Moms conference at a highly discounted rate. I was not asked to blog about this conference or my experiences. I also stayed a few extra days on my own dime and I am left handed. All thoughts are my own. Thanks Kelly! I could say the same about you. I especially liked that blue dress you had on when I saw you at Hollywood Studios! where can I buy this shirt? !